Many of course say very positive and wonderful things—the best I have heard so far being “I am proud of you.”, “I feel so happy to share your joy.” “I am delighted and wish you all the success you deserve.” And I know they mean it from the heart—so I accept their words gratefully. 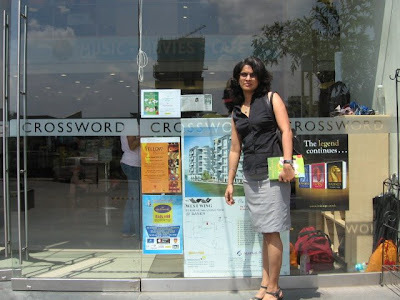 Many many months back, when I had just begun writing, Satish and I went to a book store. I saw rows upon row of books by different authors arranged so well, graded into different categories, beckoning you to pick up one and devour it. Having my book there among all these erudite authors seemed a distant dream, a mere wishful thinking, a deep longing and a fantasy that I did not even dare visualise. I just smiled and brushed it aside as fond praise from a loving husband. It has been an arduous journey since then consisting of slogging, sweating, toiling and burning the midnight oil, spending hours and hours writing, re writing, editing, contacting publishers and what-have-you and what-have-you-not! The seemingly distant dream came true yesterday. We went to Crossword last evening and it was one of the proudest moments of my life. One part of me felt overjoyed, elated, and euphoric. Another part of me was filled with sadness that my dad could never be a pa rt of this. Satish was so very proud. For about five minutes Satish and I could not speak, and we stood staring at the book shelves which prominently had my book displayed. I could not talk at all. I was a vortex of emotions—I did not know whether to laugh or to cry and I just stood there posing for the pictures which Satish wanted to click. I have started getting invitations from Clubs and colleges to give talks about my book. That will happen sometime in the near future. Yesterday, I was in conversation with the Editor of Times of India Pune plusses. He was very sweet, supportive and extremely encouraging. For me, more than the money (which to be honest is hardly anything) it is reaching out to people which matters. If this book has made you think, made you smile, made you live at least one day fully, then I’d think it has succeeded. This book was born out of deep grief and helplessness. This book is entirely for my dad. More than the destination, it is the journey which has made it all worth it. If you happen to live abroad and want to order it online, you will have to place an order with any of the online sites (Eg:Rediff or Indiaplaza.in) and they will contact the publishers and get it for you. Hope you have the most memorable Journey!! This is just the beginning of the celeb-you. May you become the most popular author ever. :-) And I mean it! See you soon in Bengaluru. when u were newly married think "I cant believe I'm married"
when u had a child, u touched him in wonder & thought "I cant believe I'm a mother now"
and now u r in the stage where u cant believe u r a full fledged author!!!!!!!!!!! Before long u'll get used to this also. Remember, Good Things Happen To Good People!!!!!!! Suma: You have read most of it! Most are from my blog posts and some new ones.And hey--thanks! Mathew: Check your mail (and you know what i mean! );-)Thanks Mathew. Nikhil: Wah!Tere muh mein ghee shakkar!! Reflections: Well--i never said I cannot believe it!! I worked like a dog--so yes I am enjoying it while it is happening.And hey--thanks so much. Congratulations Preeti - so proud of you. I hope we can buy this book via amazon in the future? It was really good to see all those posters put up in crossword. Congrats Preethi! you may not know me, but I do read you regularly. I am very happy to know about your book getting published! Great job! Congrats! Pink Dogwood/Bhavna: It works like this--once you place an order at any site--say indiaplaza.in or Rediff, then they contact the publisher and get it for you.It makes sense only if you 4-5 people are ordering(as you can share the shipping charges)--because the shipping wil be quite high.The book costs Rs.100/- and you may end up paying five times that amount for shipping.The publishers are Srishti publishers. Varun: Could your dad relate to the blog-buddy bit? :-) For me its just friends--be it online or offline--and maybe fellow bloggers.And yeah--see u soon! Argee:Of course I know you from my comment box.Thanks!Book's now out in Stores--its already published. 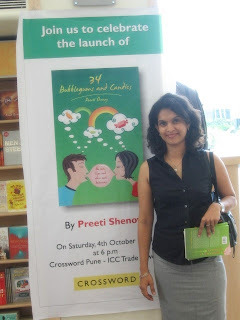 This is the 1st time i am reading ur blog ..
Btw CONGRATS AND ALL THE BEST..
read about ur kids in the previous .. i was moved .. lovely bookmarks .. :) they are really sweet and considerate kids ..
Btw wont there be a launch in Crosswords, Chennai ??? am sure everyone will love your book the way they love your blog. Its one of the best blogs I have read when i want little cheerful attitude towards life. And yes!!! 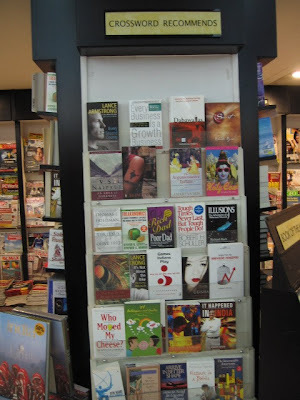 more than anything, its wonderful to see your book there out in the stands and it sure is a proud moment.. I'm so happy for you and the family. Congratulations again!! And All the best for everything. I will be travelling to india soon and sure want to get hold of your book when i am there. One point I thought might need attention - You mentioned that the publishers are Srishti publishers and The newpaper article you have in this post says Shruti Publishers. Which one is it??? The feeling must be amazing and its clear from the post.. Need to get one copy for myself..
Congrats, Preeti. Hope this is just the beginning of more such exciting moments. When dreams come true, it is magical. Enjoy these well deserved moments! Congratulations!! Indeed, it is produest moment. Reaping time. Just revel in it. Its never going to be enough and easy paying tributes to your efforts in the making of this triumphant entry to a life as a writer. But nevertheless as an ideal tribute to you I would love to write a book on this marathon effort of yours giving it the deserved title "THE MAKING OF AN ICON". Your have all the ingredients which would make anybody look upon you to show way and learn how to live ones life. And that is the way Icons are meant to be. Am too glad to be even able to communicate with you, in whatever small way it may be. Hearty Congratulations....Way to go. Good Luck for your future Books. I'm sure this'd be a big hit. So Happy for u Preeti... Really am :)! i ll visit the online site and try buy the book! BTW i donno what would be the appropriate words..so if i've said anything foolish to xpress my joy for u..sorry abt that! "More than the destination, it is the journey which has made it all worth it." Pavi: Oh no! !U havent said anything 'foolish' Please forgive me if I sounded arrogant! Not my intwtion at all--just that sometimes it gets to me when people trivialise it. (I know u dont do it)And hey--thanks! Dhanya: Ooh! !Was hoping to meet all my online friends.Never mind--take lots of good pictures! xh: it will be available even before 10th--and hey--thanks! Monika:Yes--it indeed feels great.All the best to your husband. Niall:I know my friend.Your words had a great impact on me.I have mentioned it in the last section of the book. Life begins: Srishti--I had noticed the typo--now have added a note post your comment.Thanks! 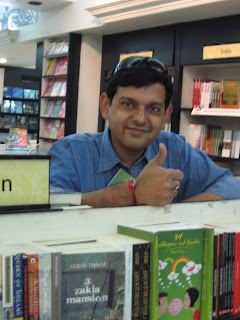 Teju:Thnk you so much!Yes--the book is very much in blog style. Meenu:Thank u! !Yes most probably there will a author read meet in Chennai--dates not yet finalised. Loved Satish's picture the best of the lot! Hey PS wow Im sooooo happy for ya hun! CONGRATTZ n ALL THE BEST for the future too HUGS! Ur looking lovely in the pics...so radiant and beautiful! Keep spreading love n light! Aneri Maasi: thank you so much! Hearty congratulations to you from across the pond, Preeti. This weekend, I'm off to buy the book! You rock girl!! well that was me :D...but dint meant ne harm :)...wishing u all the success! I thought the book will be launched when u will be visiting bangalore...now m confused whether to buy now or wait till 10th?? Prakhar: Well many more said that--so it wasnt just you :) And yes I do know it was well meant! U can buy earlier if you don't want to wait!Typically books are on shelves for at least a week before the launch as at least a few people would ahve read it. Congratulations. Just remember that blessings of your Dad are always with you. You have made everyone near and dear proud. My my my.. I visit this space after a while and look what's happened. Congratulations. This sure is a feat. Here's to a lot more coming your way. Dunno have asked this b4...is it available on amazon yet...to be bought in the US? Congratulations a Gazillion times over!!! Yay...i met an author in Person!! K10:Thank you! !Please come for my launch on 4th!Give me your mail id--will send u a formal invite. J:Thank you--and I demand to be included in your list of blog readers. Jack:Deep inside I know its all my dad's blessings but his physical presence would have been great. Veena:Thanks so much!! I know you are. You deserve every single happiness associated with this book coming out. I cant wait to get my hands on it to read!!! I am so proud to have met someone like you online....And I mean it!!! Congratulations. Now I can tell all my friends I know an author! See u soon.. God Bless U!! wow! are we all proud of you or what! i still have not been able to get my hands on the book, so sorry! but i am working on it! :) you should now looks at a nationwide launch too! IS it already released in Bangalore Crossword or other bookstalls also??? i'm eagerly awaiting..
Preeti, Heartiest Congratulations! May you always be blessed! Hello Preeti,You can mail me at ketan.pandit@gmail.com. I am excited about the launch! Shachi: Thanks so much! Where are you based? Gazal: Thanks so much.I'm waiting to meet all the people in the blogosphere too.Really looking forward to that. Vinni: :-) Well--it will be available nationwide. Pai:Yep--see you soooon!! I look forward to seeing you again. Hey we bought your books yesterday. Finished reading it too yesterday itself. Had read most of them but not all. SMM: Thanks for buying :-) Yes--its based on my blog posts like I have been telling. Delhi is not ruled out entirely. But not on the agenda right now. Ambled into Crossword today, saw your book on the shelves, picked a copy..... and put it right back!!!!! Amit: :-) Well I'd have gladly signed it for you had you brought it to the launch. See you tomorrow! She bought it for the reading.. me for the bookmarks!!! Shachi:Just happened to be on my blog and up pops your message.I think Indiaclub.com is planning to stock it for those in the US. and shachi:Thanks!I appreciate your kind words! Hi Preeti..Congrats on the book,shall buy it ASAP-if you are coming to Chennai for the launch-very well,I can get my copy autographed by you.I've been reading your blog for quite some time now,but I was a lurker all the while...but this one time,I wanted to be a part of your joy and hence took the plunge.All the very best for the book launch..I feel very proud for having known you,at least through the blogs. I'd been meaning to comment on this post after grabbing my copy .. but seems then i'd have to wait for few more days until it hits Cochin and by then i'd be missing out all the happenings in this space! Congratulations!!! You are a star! May you have a lot of success in the coming years! PS: Can you write a post on how you went about the whole process? Maybe some of us dreamers here can benefit from it and be in your shoes someday. Cris:Yes--it is indeed a dream come true. Solitaire:There is a whole chapter at the end in thsi book, which explains 'how this bok came to be'. Balu: Yeah--he was so proud! Divya:Thanks so much.I did happen to see your food blog and found it interesting.Chennai will happen but not in october. Book will be in stores soon. And your Father IS a part of this! heres to brilliant success of this book! 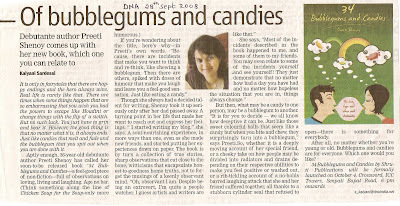 I read about your book and blog in today's times of India and made a mental note of visiting your blog when I get online. I am still not done with going through the length and breadth of your blog but whatever I read made me feel very good. You sound like a person next door even though you have touched dizzying heights and that is what is so endearing about you. You may not revert back to this comment and I might sound like one more face in the crowd, but I want to wish you all the success in your literary career. May you get the Booker prize one day :-) God bless! Stillness speaks: thank you for those really kind words! You means Saturday's times of India right? for me, each person who takes the time to comment on my blog is important--and I do try and revert to each and every comment! Cheers and thanks again! Devil Mood: i gree with you now.He truly is.